It’s high time to all the aspirants and professionals to get yourself enrolled and get the certificate of the most awaited NEBOSH on Process safety management. It’s a privilege for Green World Group to attain the authorization first in Saudi Arabia. As a grand opening and success the first batch on Process Safety Management course was held in the premises of Oil and Gas giant Saudi Aramco. Giant is not the word to be described its simply humongous talks about the success of Green World Group in the field of training to the health and safety professionals. 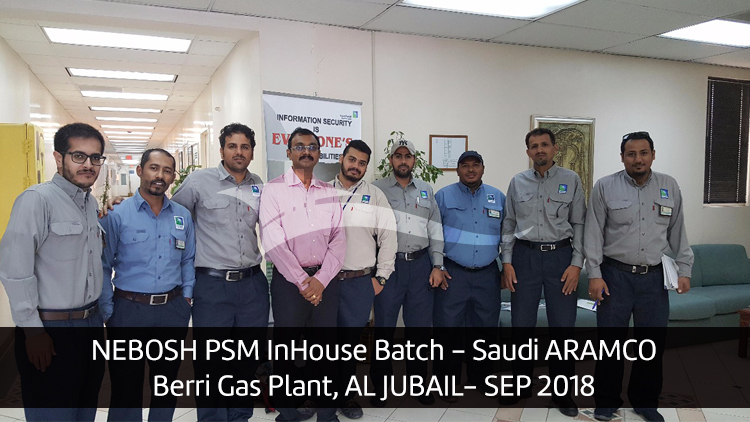 The training was conducted in the Saudi Aramco plant which was trained by our CEO Mr.Shanker SreeKumar who is dynamic and energetic in his presentation skill to deliver the best to the delegates, having an experience of more than a decade counting 17 years in various sectors like Oil and Gas, Manufacturing industries, Electrical Distribution etc. He is a vibrant trainer with extraordinary persona, where the delegates feels comfortable having a fulfilment that they had gained knowledge. The training comprised of people from different nationalities working in different supervisory categories of Aramco. On the end the response for the course was overwhelming and got a feedback from the delegates like they had the best training until date which imparted lot of knowledge into them and they thanked the green world group for making such an amazing training. You want to be the next process Safety management certified. Approach the green world group for the further assistance.